Pours a dark caramel color producing an average off-white fizzy head that quickly dissipates. Body has a fairly high clarity for the style and is very still. Settled color is still dark caramel. The initial aroma consisted of a light roasted malt presence. We expected a more dominant roasty - toasty - vanilla presence. The vanilla was there, but not too aromatic. Initial taste is sweet with a smoothness from the vanilla that tempers the sweetness making it drinkable. 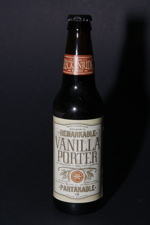 The real vanilla beans give a slight bitterness and add to the overall quality of the taste. Finish is slightly roasted. Although it's light and has a watery body, the vanilla creates a creamy texture that is very smooth on the palate. The carbonation if rather soft and the mouth is left wet - not oily and not dry. The vanilla presence is dominant in the taste and light in the aroma - as you would expect a porter to be - it was light and very drinkable. It was smooth to drink. Our mouths were pleased with the vanilla, paired with the roasted chocolate.